Marc H. Choko, Paul Bourassa, Gérard Baril, Le Design au Québec: industriel, graphique, de mode, Montreal: Les Éditions l'homme, 2003. In his preface to Marc Choko, Paul Bourassa, and Gérald Baril's Le design au Québec, Michel Dallaire explains that, while he wanted to be an architect in the early 1960s, his lack of a classical education and his father's anticlericalism kept him shut out of Quebec architecture school. However, he was able to go into industrial design at the Institut des arts appliqués de Montréal. From there he went to Sweden to work and gain experience. Upon his return to Montreal Dallaire found that there was lots of work for designers, including those from all over the planet. Industrial designers, signage designers, graphic designers, urban designers, fashion designers, interior designers, they all were able to find work designing for the new Métro system, Expo 67, etc. As Dallaire explains, following Expo 67 there was a lull of work for several years until the preparation for the 1976 Olympic games. However, most of the work done by designers following the heyday of Expo was for American manufacturing companies or their Canadian subsidiaries. There was also some work for local small and medium sized businesses. Also, during the 1970s the teaching of design underwent several years of neglect, leading to businesses becoming unwilling to pay for the development of locally produced industrial, graphic, or other kinds of design. While they would invest in new technology, they would not invest in new designs for their products, choosing instead to invest their money in copying their competition rather than risking anything on new, innovative designs. However, Dallaire claims that things had changes so that, at the time he was writing, businesses knew that, at least in the case of industrial design, good design is required from the start of the conception process. While economizing and streamlining production are important, what is more important is seducing the public to want the product. Sales cannot happen without the seduction of the public. The forward of the book is written by Marc H. Choko, who simply thanks the other authors for writing the other sections of the book and for participating in the project. He also notes that the book was the second such history of design project, following upon L'affiche au Québec (The Poster in Quebec). Choko is also the author of the introduction, which he begins by asking "What is design?" Before examining the history of Quebec's design community and the areas upon which it has focused, Choko explains that the authors began their conceptual process by going out onto the street (specifically Boul. St. Laurent, in the heart of the fashionable Plateau Mont-Royal) to ask people what they thought design was. While they received a number of responses, including claims that it was a superficial treatment of things so as to make them more attractive, many claimed that design is what makes things, and thus life, beautiful. Choko next offers a brief overview of the history of design in general before introducing the book's three sections on industrial design, graphic design, and fashion design. He begins by noting that, while the word design was used prior to the industrial revolution, it was really with that explosion in the production of products on a mass scale, for all of society, and in a manner which reduced the production process to a series of disjointed steps, that design developed as a trade. Furthermore, as the industrial revolution began in Britain, so did the field of design. Offering a number of dictionary definitions of design, Choko suggests that the word "design" can range from meaning the plan for a work of art, to the conception of some product and its integration into the chain of production. He recognizes that issues such as art or technique, form and use, craft and industrial production are all issues of contention in reaching a definition of design. For example, while there was a report on the fabricated arts at the Great Exhibition of 1851, which examined the design of mass-produced objects, this was answered by the rise of the Arts and Crafts movement with its desire to design and create high quality crafts by hand and not by industrial means. Yet, their distain for industry meant that few people could afford their labour intensive products. Rather, it was with the Deutscher Werkbund, established in Munich in 1907 by Hermann Muthesius after a long trip to England, that the first real attempts was made to remove the divide between art and society. Working with modernist artists including Peter Behrens, Walter Gropius, and Henry Van de Velde, the Deutscher Werkbund tried to not only make products which were practical, but which also offered a degree of pleasure. This was followed, in 1908, with Adolf Loos' book Ornament and Crime in which he argues that cultural progress occurs with the removal of all ornamentation from utilitarian objects. This idea was central to the modern movement's notion of form following function, where that which is wholly functional is beautiful. This notion of glorification of the purity function was accompanied in 1909 with the publication of Filippo Marinetti's Futurismo, a manifesto which glorifies both speed and the machine. The realization of utilitarian objects, and thus beautiful art created for the masses, came with the Soviet Revolution of 1917. Focusing upon creating an efficient state which produced the most efficient materials of equal quality for all, the revolutionaries were preoccupied with graphic design, architecture, industrial design, and even style, which would not only be efficient, but would be beautiful in it efficiency. This led to research done in the USSR by El Lissitsky (Lazar Markovich), Alexander Rodchenko, Igor Tatlin and the Vesnin brothers, among others, and which was carried out at the same time as the Dutch avant-grade De Stijl movement in 1917 by Theo van Doesburg, Gerrit Rietveld, Hans Arp, Gino Severini, and Piet Mondrian. Some of the soviet Vkhutemas (the graduate workshops of artists and technicians) soon came to argue for utilitarianism at the expense of any aesthetic, claiming that any ornamentation was bourgeois. Ornamentation was seen as a waste of resources, and thus a crime against the society. Rather they held that form must follow function, remaining honest to the materials, including adding little colour. In Germany an art and design school, opened by Walter Gropius, was established in 1919. Named the Bauhaus, it attracted instructors including Johannes Itten, Lyonel Feininger, Paul Klee, Wassily Kandinsky, Josef Albers, Laszlo Moholy-Nagy, and Theo van Doesburg. The school followed the Arts and Crafts movement in merging a school of fine arts and a school of applied arts. It advocated reconciliation between function and aesthetics. However, especially after relocating to a specially designed campus in Dessau in 1925, the school evolved more towards emphasizing the industrial arts and industrial design, with a renewed unity between art and technology. The period from 1920 to 1930 saw the rise of the functionalist movement, which acted to raise public support for a society which was dominated by scientific and technical progress, as well as to embrace an aesthetic of the machine, including the beauty of the expression of functions. However, this also led to contradictions. In both Europe and the United States industrial design was often used to dress products in the garb of modernist design. For example, Raymond Loewy and his aesthetic creations, based upon the streamline styling which was central to American design from the 1930s to the 1950s, did not necessarily create or inspire practical designs. The Second World War constituted a turning point, when technology was employed to develop new materials, and when design needed to make use of the most efficient materials in the most efficient ways possible. Not only did it mark the dominance of form conforming with technological capabilities, but it also established the United States as the dominant force in industrial production. Furthermore, the war and its aftermath saw the word "design" enter common language. In 1944 the British government established the Council of Industrial Design, while 1954 saw the establishment of the Associazione per il Disegno Industriale in Italy. Finally in 1959 the word was included in the Robert dictionary, entering the French language. Initially associated with industrial design, the word soon came to be used with the development of objects, furniture, and interior decoration. The return to utilitarian, practical design came with the establishment in 1955 of the Ulm School in Germany which had the objective of making daily life more human, paying attention to environmental conditions and human needs and incorporating them into designs. The school aimed at coordinating social, technical, and aesthetic concerns. In Quebec, up until the Second World War, design, which did not yet exist as a specialty or a program, was part of what was taught and learned by people in fine arts and architecture programs. It was also practiced by those who taught or attended technical and crafts schools, as well as by people who were self-taught and working in fields including furniture making, printing, and the clothing industry. The field developed as instructors learned more and more about the field of design and as those practicing design began to coordinate themselves within organizations and associations. The main objectives of such organizations were to promote exchange between practitioners, as well as to have the elites of society, as well as the general public recognize their works, which was accomplished through publications and exhibitions. The first step in the development of Quebec industrial design was the establishment in 1930 of a cabinet-making program in Technical Schools. This was followed in 1935 with the École du meuble de Montréal, which offered vocational training in the fields of interior design and the applied arts, and which was inspired by the French decorative arts. However, this craft-oriented, woodworking-focused program did not incorporate industrial design which made use of new materials or mass production. Thus, its impact remained limited. Indeed, it was only in the late 1960s and the early 1970s, with the creation of the industrial design section of the Faculty of Management at the Université de Montréal, as well as the environmental design program introduced at the Université du Québec a Montréal that the teaching of modern industrial design was truly introduced to Quebec. In the case of graphic design, the one related field in Quebec up until and after the 1940s was commercial art. In the 1940s programs in commercial art were taught at the School of Graphic Arts, the Art Association of Montreal, the School of Fine Arts, and Sir George Williams College. As in the case of industrial design, it was not until the late 1960s and early 1970s when distinct courses in graphic design were introduced into the province's colleges and universities. Finally, in the case of fashion design, a provincial fashion profession was actually started by the Quebec government in 1946 with the opening of the École des métiers commerciaux de Montréal, Later many other colleges, including the LaSalle College Group, would open similar programs. In addition to the establishment of teaching programs, the twentieth century saw the establishment of several professional design associations. In 1933 the Association of Interior Decorators was established, becoming the Société des décorateurs-ensembliers du Québec in 1948, the Société des designers d'intérieur du Québec in 1992, and finally the Association des designers d’intérieur du Québec in 2003. In addition, the Association des designers industriels du Québec was founded in 1958. In the case of graphic design, the Art Directors Club of Montreal was established in 1951 and the Société des graphistes du Québec was founded in 1974, becoming the Société des designers graphiques du Québec in 1994. Finally, in the case of fashion, the Association des couturiers canadiens was established in Montreal in 1954. An essential part of the penetration and diffusion of the different fields of design within Quebec, and their recognition in shaping society was accomplished through advertisements and journals. Such Quebec design journals included Fashion Magazine (1945 to 1949), Culture vivante (1955-1973), Élan (1967-1993), Décormag (since 1972), Grif Design (in the mid-1980) and Intérieurs, Graphisme Québec, and Grafika. Many of these publications also promoted exhibitions of designed works. Furthermore, following the Second World War the federal government became involved in promoting design in an effort to encourage the development of Canadian products which made use of new products and mew methods of manufacturing, so as to increase domestic consumption and export of Canadian products. Beginning in 1945 a number of articles appeared in Canadian Art selling the merits of design for both industry and the consumer. In 1946 the National Gallery and the National Film Board organized a travelling exhibition entitled Design in Industry. The catalogue of the exhibition was created by Donald W. Buchanan of the NFB. In 1947 an industrial design section of the National Gallery was created, as was the National Council of Industrial Design. The council was to identify and publicize "good design", as well as award annual prizes for the best achievements in the field. Finally, in 1953 a new "art gallery", called the Design Centre was opened in downtown Ottawa by the Design Council to showcase examples of good Canadian design. Directed at the customer, the manufacturer, and the retailer, the gallery was to honor "artists" who created the items of everyday use. It stressed that such everyday objects can be looked at as not just useful objects or merchandise, but also as works of art. In 1961 the National Council of Industrial Design was made part of the federal Department of Trade and Industry. The department then opened another design centre in Toronto in 1964 and another in Montreal in Place Bonaventure in 1966. However, both centres were eventually closed in 1970. Provincially the Montreal Museum of Fine Arts, the Montreal Museum of Decorative Arts, the Musée national des beaux-arts du Québec, and the Musée de la civilisation du Québec have all held various exhibitions on design in the decades following the Second World War. 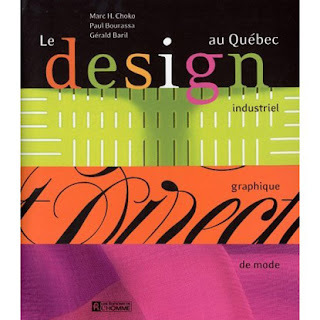 As of 2003 the main venue for design in Quebec was the Centre de création et de diffusion en design of the Université du Québec a Montréal, which was launched in 1981 at the behest of instructors at the university. The centre teaches graphic design, industrial design, architecture, and fashion, showcases the work of Quebec designers, and also presents exhibitions from Quebec and abroad. Also written by Choko, the second section of Le design au Québec is dedicated to the history of graphic design in the province. As Choko explains, up until the 1940s graphic design in Quebec was left largely to the hands of small-scale, unprofessional artisans, and was not a separate profession. It was only following the Second World War that large agencies began to be developed, as was the profession itself. Teaching adapted as the profession became specialized and began to be taught in colleges and universities. From typography to photocomposition and computer graphics, technical resources also changed and revolutionized roles and practices. Choko explains that one of the main problems of writing a history of graphic design in Quebec is that many of the creations of the field are often considered ephemera. Many of the works passed from designer, to art directors, to clients, to printers, but in many cases, it was not thought important to keep any copies of the original work for posterity. At the time, no one considered that the field would be of historical interest. Thus, it is as though many of the main participants have died, since much of the original work no longer exists. Wile not an excuse, it does explain the difficulty in uncovering archival material on many pieces. Choko also notes that much of the history he will be presenting is centred on Montreal, which he explains is only because it was the centre of Quebec's graphic design industry, although there are some studios elsewhere in Quebec. As the economic centre of the province, Montreal was where many of the companies hiring graphic designers were located. He further explains that, for the different periods of Quebec graphic design history presented, he discusses the best and most influential works. Thus, he admits that his history does not represent the entire spectrum of graphic design which has been produced in the province. In addition to not covering all of Quebec graphic design, Choko explains that he has largely excluded poster, which he covered in L'affiche au Québec as well as logos, which were covered by Gérard Bouchud and Gilles Robert in their book 1001 symboles du Québec. He also left out graphic design used for websites and for television, as well as much of the corporate work to which twenty-first century graphic designers dedicate much of their time. In the case of corporate work, Choko also notes that he considers much corporate work relatively boring and staid, in keeping with the desires of many corporations, and thus not creations which can be seen as revolutionary or experimental. Finally, he did not include graphic design which was used for packaging, believing that such material could form the basis for an additional study. Furthermore, he expresses regret that he was unable to include works by designers whose creations could not be reproduced accurately. Understanding that it is very fashionable to claim that any history of a field of current interest in Quebec did not begin before the 1960s and the Quiet Revolution, the arrival of Expo 67, and Quebec's opening up to the world, Choko argues that for a true understanding of the history of graphic design in Quebec one must begin back in the 1940s and 1950s. Choko divides the history into five sub-periods. The years 1940 to 1950 are marked by the freedom of the post-war period and the establishment of the first commercial art courses in Quebec. The second period, 1950 to 1960, saw the arrival of the international style, or the so-called Swiss school, in Quebec, driven by European-trained designers whose work reflected a revision of the ideas of the first European modernists. The third period, saw local designers, heavily influenced by the work of the International Style, create influential and iconic works for both Expo 67 and the 1976 Olympic Games. The period from 1980 to 1990 was marked by a new beginning with the rise of postmodern design, as well as the introduction of early computer graphics. Finally the contemporary period, the 1990s and 2000s, is that of a revolution of computer-based design as well as an explosion of multicultural stylistic influences. Choko explains that graphic design began with the birth of printing and the illustration of printed notices, newsletters, and posters, composed of largely type which was enhanced with woodcuts. Layouts had already been important to the work of pre-printing scribes, whose works were simply rapidly multiplied with the arrival of the Gutenberg press and typography. Graphic design involves the ordering of information, of ideas, of format, so as to create clear and imaginative communication, as well as to attract the attention of the audience. Choko references Brain Donnelly's Graphic Design in Canada Since 1945 in claiming that graphic design has differentiated itself from the work of advertising agencies, of commercial art departments, of printers, of printing, engraving workshops, and typography. While it is derived from the art of typography, over time it has evolved to include much more than typographic design and typesetting design, including the design of the page layout, the creation and arrangement of illustrations and photographs, ensuring the legibility and proper positioning of words or characters, so as to create pieces of effective overall communication. Although Choko does acknowledge the influence of Germany's Jan Tschichold and his modernist creations of the 1920s upon modern graphic design, he argues that one must not forget the earlier influence of the works of the Englishmen William Nicholson and James Pryde (referred to as the Beggarstaff Brothers) in the late nineteenth century, of the German poster design and theoretician Lucian Bernhard in the first decade of the twentieth century, of the Dada movement which began in Zurich in the 1910s, of the Soviet Union in the 1920s, of the advances of Keller Ernst in Switzerland, Herbert Bayer in Austria, of the Hungarian Laszio Moholy-Nagy in Germany, of Peter Zwart in Holland, or of Adolphe Mouron Cassandre and Jean Carlu in France during the 1930s. The term "graphic design" was first used in 1922 by the American type and book designer William Addison Dwiggins. In Canada, prior to the 1960s when the term became common, graphic designers worked in commercial art, and they were referred to as graphic artists, typographers, commercial artists, and layout artists. Commercial art was very closely related to illustrated advertising and very much inspired by the American school, and had rather pejorative connotations for modernists. Allan Harrison, like Charles Fainmel and Henry Eveleigh in Montreal or Clair Stewart in Toronto would use the term "advertising art" instead, borrowing from the French term "l'art publicitaire." It was also the title of a long series of articles published in 1948 by Gérard Perrault, director of the advertising department of the École des arts graphique de Montréal. Furthermore, in 1945 Allan Harrison declared in Canadian Art that one should not become what is known as a "commercial" artist, or the kind of artist for whom painting is "serious" art. Rather, he claimed that all art was serious. That same year, when Harrison had his works exhibited at the Art Association of Montreal his graphic creations were seen to be paintings. In addition, in the introduction to a 1977 book on the work of Rolf Harder and Ernst Roch, Harrison claimed that art is only about quality, not about ambition or compensation, rejecting the notion that one's work is not real art if it is created for a particular purpose, or that there is a difference between the applied arts and the fine arts. In the article "The Proper Function of Advertising", published in Canadian Art in 1947, Charles Fainmel and Henry Eveleigh claimed that the artist is to play a service for society, blending art and business, talent and theory. The artist must use his creative abilities to create and have their clients believe in the highest quality functionalism and symbolism. As Choko notes, this and other comments showed that, during the 1940s, there was unrest amongst "advertising artists" who were involved in design and were agitating for a separation into a distinct profession. Not all advertising artists felt the same way. Adolphe Mouron Cassandre, artistic director of Alliance graphique in Paris claimed that painting was an end in itself, and that a poster was a form of communication between a merchant and the public. Such posters did not create messages, they simply forwarded them. The artist's job is to forward those messages clearly, powerfully, and accurately. However, this position was not shared by either Allan Harrison or Henry Eveleigh, who both eventually quit commercial art to take up painting. The term graphic design finally came into widespread use in Quebec in the late 1960s and 1970s with the opening of design programs which were fully separate from fine arts programs. By 2003, when Choko was writing, it was the most commonly used term. Choko explains that analysis of typography, and the encouragement of experimentation, began in Quebec between the wars with attempts to promote the benefits of advertizing for businesses. For example, 1926 saw the launch of the French-Canadian illustrated magazine Le Clé d'or, which was dedicated to visual advertising. Supported by some advertising agencies and the Rolland Paper Company, the periodical contained many ads which were largely very conservative in character, and appeared to be of an earlier time. The typography of a number of the advertisements, however, was more advanced. This was partially the result of advances in the technology used. To further advance the state of typographic design, the Club des gradués en typography, which later became the Club typographique de Montréal, was established in 1928. Having a dozen members, it was attached to the École technique de Montréal, and by 1938 its numbers had grown to 60. Its review, launched in 1928, and which often included texts by Belgian and French collaborators, only lasted two years. During the 1920s local, bold, and decidedly modern works were rare, and when they did appear they were often made in the popular European Art Deco style. This European influence was particularly strong among Quebec graphic designers, such as Omer Parent, who was educated at the École des beaux-arts de Quebec and then received further training in Europe, particularly Paris. Returning to Quebec, Parent worked briefly with Raoul Bonin (1928 to 1929, a period from which no material appears to have survived) before becoming the interior designer and decorator for the Henry Morgan & Co. department store on St. Catherine Street from 1929 until 1936. He eventually returned to Quebec City where he spent most of his time teaching. Advertising of the 1930s was celebrated in 1939 and 1940 by both the advertising industry and Quebec paper companies who owned Les éditions Le Droit, which published L'Annuaire de la publicité et de l'imprimerie (press, radio, art graphiques) in 1939 and 1940. Choko notes that the advertising shown in the 1939 edition underlines the position of large advertising agencies in North America at the time. In Canada the first advertising agency was established in Montreal in 1889 by Anson McKim. Run by Anglophones and dealing largely with English ads, such English agencies were followed in 1908 by the first francophone agency, la Canadian Advertising Agency. In 1910 the Advertising Sales Executive Club of Montreal was created, and from the 1930s it offered courses in collaboration with McGill University. It was not until 1959 that the Advertising Club of Montreal was established. All of these advertising agencies and organizations dominated visual design at the time. They were the mediators between designers and clients, and they certainly did not push for innovation or experimentation in design, but rather were very conservative, largely only allowing designers to borrow from styles which had been successful in other markets. By the 1940s a small number of designers were attempting to advance a new kind of modern design in Quebec. While often inspired by European designers, influenced by magazines, or through trips to London and Paris, their design developments came to stand on their own. However, the first major opportunity for Quebec graphic designers (more accurately, those doing what came to be understood as graphic design) to experiment and not follow convention came from outside Quebec. Many of these designers were hired during the war by the newly created National Film Board of Canada, which was directed by John Grierson. In addition to creating films which supported the war effort, the NFB created posters, publications, and other wartime propaganda. To create these works Grierson hired a number of talented designers, including Harry Mayerovitch (Mayo). According to Donnelly, these designers also included others, such as Carl Dair and Henry Eveleigh. Following the war, when the government was beginning to promote the importance of design, especially in the case of industrial design, the journal Canadian Art was launched and dedicated numerous articles to discussing the achievements and theories of design in Canada. In articles by Allan Harrison, an admirer of the poster designers Cassandre, Carlu, McKnight Kauffer, and Bayer, expressed his hope that Canadian designers might soon be free from the dominant style of American realism, and instead turn their imagination more towards an inventive symbolism. Referencing the works of the Montrealers Raoul Bonin, Charles Fainmel, and Ian Lindsay, Harrison hoped to see the birth of a new Canadian school of design. Harrison had been born in Montreal where he studied at the École des beaux-arts. From 1933 to 1935 he lived in London, working as a graphic designer before travelling to Paris, where he was able to meet Cassandra. Returning to Montreal before the war, Harrison became the artistic director at the advertising agency of J. Walker Thompson, which would eventually send him to work in its offices in Rio de Janeiro from 1946 to 1947, and then in New York during the 1950s. The few surviving works by Harrison show his evolution towards a modern style of design, combining a thorough understanding of typography with that of geometric composition and photomontage. However, in the early 1950s Harrison left graphic design to concentrate exclusively on painting. In the case of Charles Fainmel, Choko explains that he and the other authors were not able to find very many examples of his work, and while what they did find suggests that he worked largely on commercial projects, the work that was found had various "good" qualities. His works mix geometric designs and collage, reminiscent of the Soviet constructivist movement, as seen in the work of Russian designers such as the Stenberg brothers. However, Fainmel also drew, painted, and sculpted, and by the 1920s he had exhibited his work with the Art Association of Montreal, the National Gallery of Canada, and the Royal Canadian Academy. He even had his sculptures shown at the Salon d'Automne and the Société des artistes indépendants in Paris in 1932. In 1946 the Art Association of Montreal devoted an entire show to Fainmel, displaying not just his fine art, but also his graphic advertising work as well. When asked by a Montreal Standard journalist at the time of the 1946 show to comment on the difference between European and Canadian graphic work, Fainmel claimed that there are only two criteria for judging graphic works, they are either very good or very bad. In Canada, he claimed that one only found the latter. According to Choko, little is known of Ian Lindsay or his work except for a poster he designed for the National Film Board to illustrate an article by Harrison. Finally, the last designer of this first era of design was Raoul Bonin, about whom little is also known. He was born in Montreal, and eventually took correspondence art courses offered out of Chicago. He eventually attended the School of Fine and Applied Arts in New York, completing his studies with two years in Paris. While some of his works have survived, nothing is known of his pre-war creations. Those examples of his wartime and post-war work show the obvious influence of Cassandre and Jean Carlu, although Bonin had developed his own style, and did not simply reproduce examples of their work. However, Bonon's influence ended early in the development of Canada's graphic design profession. He died in 1951. Importantly, as was noted by Allan Harrison in a 1958 article in Vie des arts dedicated to Bonin (inaccurately titled "Raoul Bonin, 1904-1949"), Bonin was aware, as were many European designers of the time, that design did not need to be crowed with detail, but that ideas can often be referenced more easily through simple symbols than through multiple scattered details. In addition to marking the beginning of modern graphic design in Quebec through their work, some of the influential designers of the period also began teaching during the 1940s. In 1945 Allan Harrison taught advertising art at the Art Association of Montreal's School of Art and Design. (The Art Association of Montreal became the Montreal Museum of Fine Art in 1948.) Charles Fainmel also instructed in the Association's design program. In addition, beginning in 1947, Henry Eveleigh headed the commercial art program at Montreal's École des beaux-arts. However, in addition to teaching, each of these designers continued their creative careers, often being hired by Montreal companies, including the city's successful high-tech industry, to create designs which matched the innovative spirit of the companies' products. These companies included Ayerst, McKenna & Harrison, Abbott Laboratories, Canadian Celanese, EB Eddy Co., Canadian Aviation Electronics, and Canadian Industries. One of the designers who worked on these corporate designs, who had worked for the National Film Board, and whose work and influence would extend into the 1950s, was Henry Eveleigh. Eveleigh had been born in Shanghai, but was raised in London, attending the Slade School of Fine Arts. He had begun his career as a printer, designing, typesetting, and printing posters for a living. He immigrated to Montreal in 1938, working briefly for Woodward Press, thanks to the help of Charles Fainmel, whom he had come to know. He then worked as a freelance designer. He would eventually set up a studio with Carl Dair in 1947 following their work at the NFB. Dair began his career as a designer for the Stratford Beacon Herald, becoming an itinerant printer during the 1930s. In 1940 he moved to Montreal where he became art director for a department store before becoming director of typography at the NFB in 1945. While taking the radical step of opening a studio which was specifically focused upon design, and which was not part of a larger advertising firm, Dair left the business in 1951, a year after the firm's name was changed to Cossman, Eveleigh, Dair. Following Dair's departure, Eveleigh increasingly concentrated upon his painting and teaching. Of the pair, Dair appears to have been more oriented towards design and typography, while Eveleigh was more of an illustrator and artist-philosopher. Eveleigh was fond of abstract shapes, curves, and advertisements which bordered on animated design, and which was oriented towards classical informative modernism. In contrast Carl Dair was a master of rigorous geometry, balanced composition of space, playful typography, clear lines, and complete design. While all of these post-war developments were significant, the most important event in graphic design in Quebec directly after the war was, according to Choko, the 1946 opening of a department in the École des arts graphiques dedicated to advertising art. Established in downtown Montreal opposite the École des beaux-arts, in space owned by the École technique, the department was given the blessing of the Archbishop in August 1942, but it was not announced until March 1944 that it would actually be opening. Named the École des arts graphique, its purpose was to train both artisans and technicians of the various steps involved in printing so that they are able to illustrate and work in the printing and binding trade. The new school was headed by Gérard Perrault, who published a series of four articles between December 1946 and May 1947 in technical journals highlighting all of the ambiguities which he saw between good design and the realities of the printing, publishing, and advertising trades. In particular, he makes the distinction between the fine and applied arts, where those involved in the fine arts are able to work with few restrictions, while one who is involved in commercial art is limited in the interpretation and approach he or she can take. He does praise the influence of European commercial artists who either moved to America or whose influence was widely felt there (including Cassandre, Carlu, Klinger and Binder), recognizing that their work has inspired the quality works of the Canadian commercial arts such as Charles Fainmel, Omer Parent, Henry Eveleigh and Carl Dair. However, he also despairs that there is a large amount of poor quality commercial art being produced in Quebec and Canada. He argued that much commercial art in Canada often makes use of awkward and outdated graphics, and typically involves too much text. This approach to commercial design did not borrow any of the lessons offered by contemporary art. A similar criticism of Canadian commercial art was made by Toronto's Clair Stewart in his 1948 Canadian Art article "Advertising Design in Canada." Stewart argues that there were two main reasons for the low quality of Canadian commercial art. The first was that most print ads, so he claimed, were not produced by designers, but draftsmen, who are quite capable of expressing mediocre ideas on paper. The second reason was that most designers were employed by design workshops that were dominated by art directors, and that the designers rarely had direct access to customers. Thus, rather than fight to advance good design ideas, he claimed that many talented designers simply left Canada for work elsewhere where their ideas would be acknowledged. Two of the pillars of the École des arts graphiques were the artist Albert Dumouchel and the typographer Arthur Gladu. Thanks to their connections in modernist graphic advertising , Les Ateliers d'arts graphique (No. 3) was published in 1949, highlighting some of the work of both Carl Dair and Henry Eveligh, as well as some of their ideas concerning design. While Dair claimed that typography should be understood as an abstract art, Eveleigh argued that one could, and should, consider the work of commercial artists, be it magazine cover designs or brochures, to be works of art. However, Choko claims that the words of Eveligh can Clair were not always followed, as could be seen by examining the issues of the journal Impressions during the 1950s, which often published the work of student commercial artists. However, one must also note that other advertising artists did take something away from both Dumouchel, Gladu, and the surrounding environment of the time, so as to produce works which contain experimental elements. Choko notes examples from Impressions by Roger Cabana (1945 ), Raymond Bellemare (1949), Gilles Robert 1950), Georges Huel (I95I) and Réal Séguin (1952), all of whom attended the École des arts graphiques. Furthermore, an example of the changing atmosphere concerning illustration in Quebec can be seen with the cartoonist Robert LaPalme's 1948 cover for a special edition of Canadian Art dedicated to the "Quebec Scene". The image, although not by a commercial artist/designer, suggested, with its devilish artists who are laughing at the churches surrounding them, that change was coming to the traditionally conservative Quebec fine and applied arts scene. Another event which occurred during the same era as Les Ateliers d'arts graphique was the establishment in 1949 of the Art Director's Club of Toronto. That same year the organization organized an exposition of the best Canadian graphic advertisements, publishing the entries in the first of its Annual of Advertising and Editorial Art. From the first year of its publication the annual included numerous Montrealers. Among these were Eveleigh and Dair's studio which had redesigned the Canadian Chamber of Commerce's Canadian Business as well as the work of Harry Stanfield, the designers working for both Eaton's and Morgan's department stores, Raoul Bonin, Charles Fainmel, Yalonde Delorme-Cyr, Albert Dumouchel, and Arthur Gladu. The second exposition of the Art Director's Club of Toronto was shown in Montreal in October 1950. Inspired by the Toronto Club, the Art Director's Club of Montreal was established in 1952, holding its first exhibition at the Montreal Museum of Fine Art. One of the participants in the first Toronto exhibition, Yolande Delorme was somewhat unique in a Canadian graphic design community which was overwhelmingly dominated by men. Born in Coaticook, she took evening classes in drawing at the École des beaux-arts de Montréal and was soon hired by Merchants Advertising. In 1945 she was hired as a graphic illustrator in fashion by Arnold G. Evans, the owner and director of Fashion Magazine. Then in 1950, becoming what was likely the first female artistic director in Canada, she partnered with Tancrède Marsil to form Y & M Studio, which by 1955 was employing twenty-five designers, including individuals who would come to be very influential in Canadian graphic design, such as Gérard Caron and Ernst Roch. The studio also employed Jean Fortin, who left for Paris in 1956 where he would spend the rest of his career. Yolande's partner, Marsil, was from Montreal and had gone to both the École des beaux-arts, as well as the Université de Montréal, where he had taken journalism. In 1949 he had done an internship at Publicis in Paris, and was then briefly artistic director at Eveleigh/Dair. He would go on to become the public relations director, as well as one of the partners, at Y & M Studio. Like the Art Director's Club of Toronto, the Montreal version eventually also had its exhibition participants published, with Canadian Art dedicating a 1958 issue to 141 of the 206 entries in the 7th Annual Exhibition of Advertising and Editorial Art. The exhibition had been held at the Montreal Museum of Fine Arts in June of that year. The entries included the work of designers from across the country, showcasing both good and bad design. The celebrated designers in the exhibition included Frank Lipari, who had been born in Montreal and had studied art at Sir George Williams College. After briefly working for an advertizing agency he began a career at The Gazette, which became increasingly administrative in nature. Other Quebec designers whose work was showcased in the special edition of Canadian Art included Gérard Caron (of whose other works Choko was only able to find a few examples) who worked for Y & M, as well as Hector Shanks, one of the partners of Kon & Shanks. In the 1950s the most representative and influential centre of commercial art production was the Commercial Art Centre. The Centre was created in 1951 by Gaston Parent. Parent had briefly studied at Montreal's École des beaux-arts, but learned about photography, printing, and layout through on the job training. Through his connections and business talents, he was able to build a flourishing business which was involved an all sectors of commercial art, including graphic design, photography, typesetting, and reproduction. The Commercial Art Centre touched the careers of numerous Montreal designers, employing more that a hundred people or different levels of ability by the 1950s. Even Arnaud Maggs, the self-taught Montreal graphic designer who had worked in New York, Toronto, and Milan, briefly worked for the Commercial Art Centre in 1959. That year he created a series of small contemporary, childish, cartoon-style banner ads for Parent. Choko ends his section on the 1950s by arguing that, largely unknown to the rest of the world, Quebec's influential post-war graphic designers, while capable of radical and experimental design, inhabited a world which was often much more interested in enjoying the benefits of the new mass consumption society and not challenging conventions, or at least internationally acceptable style, in promoting the products, services, or organizations of that society. Thus, several of the most experimental, or modern, of these designers eventually left the profession. Some, like Yolande Delorme and Jean Fortin went abroad where they could better employ their skills (Yolande left in 1955). Others, such as Harrison and Eveleigh eventually gave up design for teaching and painting. Of the Quebec designers featured in the 1960 special edition of the Japanese graphic art magazine IDEA dedicated to "Visual Communications in Canada," Eugenie Groh, Frank Lipari and Arnaud Maggs all moved to Toronto. Only Ernst Roch remained in Montreal. Quebec graphic designers mentioned in the special May 1960 graphic design edition of Canadian Art included Ernst Roch and Gérard Caron, Y & M Studio, and Rolf Harder. Choko begins by explaining that the International Style did not only arrive in North America in the late 1950s and 1960s. Rather, he argues that it could be seen as early as the 1930s when several architecture and poster exhibitions held at New York's Museum of Modern Art reflected the geometric formalism and search for a universal abstract language of design. Influenced through journals and visits to New York, London, Paris, Zurich, and Berlin, young Canadian designers began to incorporate elements of this rational, geometric approach to design. While Quebec designers such as Raoul Bonin, Charles Fainmel, Henry Eveleigh and Allan Harrison were all influenced by this style, as Choko argued in his previous section, they were all too early to be able to take full advantage of this new, radical approach. This, he argues, explains why they are almost universally neglected by commentators who tend to focus upon the young European immigrant designers who arrived in Montreal during the 1950s and 1960s, who were very much in touch with contemporary developments in the International Style, which was growing in international popularity, and who were thus able to be recognized in Montreal, Canada, and abroad for their designs. Furthermore, both Expo 67 and the 1976 Olympics, building upon, what was seen as the radical International Style creations being produced in Quebec, would cause the majority of commentators on Quebec and Canadian design to forget about the modern advances made by earlier Quebec designers. Within Quebec and abroad, Quebec design began with Expo 67, which put the city in the spotlight and made it the focus of numerous journals, radio, and television programs. Three people in particular are often associated with the International Style, or the Swiss Style, in Montreal: Ernst Roch, Rolf Harder and Fritz Gottschalk. However, only Gottschalk was actually from in Switzerland and can be directly identified with the Swiss School. Born in Zurich, he studied at that city's École des arts appliqués, as well as in Basel. Immigrating to Canada in 1964, Gottschalk first worked in Ottawa for Paul Arthur & Associates. The company had a contract to develop several of the graphic elements of Expo 67, to which Gottschalk contributed. Moving to Montreal in 1965, where he established his own studio, he was joined by the Hamilton native Stuart Ash in 1966, who had also been working for Paul Arthur and who brought to the studio a passion for typography. The two designers eventually opened Gottschalk + Ash International in New York in 1976 and then in Zurich in 1978 where Gottschalk returned to settle. They also had an office in Milan which closed in 1992. In a 1990 interview with Graphis, Gottschalk claimed that "The message must be transmitted without any frills or unnecessary overhead, but not without imagination. The recipient must be informed of the main features of the product and the services in question without the use of gags or fireworks." Choko argues that Ash and Gottschalk provided clients with the necessary tools, including the revolutionary Helvetica, which Ash has claimed was first introduced to Canada through their studio. While, in their early years, they always employed the geometric rigor of the International Style, yet with the addition of, what they believed, were necessary, playful elements, which should not be understood as unnecessary decorations, but important elements of their designs. Yet, according to Choko, as Gottschalk + Ash International grew to become a major communications company, their designs became more conservative, lacking in personality. While the International Style was seemingly objective and well suited for international communications, it helped lead to the "crisis of Helvetica", where design of the International Style came to be viewed as cold, uniform, and lacking in personality. Ernst Roch, by contrast, was born in Yugoslavia in 1928 to Austrian parents. He studied design in Graz and then immigrated to Canada in 1953. He first briefly worked for Rapid Grip and Batten before joining Y & M Studio in 1954. Being given a large amount of freedom to design in, what was seen in Quebec, as quite experimental styles, he remained at Y & M until 1959. Working briefly as the artistic director of James Valkus' Montreal office in 1960, he soon left to open his own studio. Finally, in 1965 he opened Design Collaborative with Rolf Harder, as well as Anthony Mann and Albert False, both of whom operated the firm's Toronto office. The Toronto office closed after only two years when Anthony Mann left to take up the position of Director of NSCAD. Roch's partner, Rolf Harder, was born in Hamburg, Germany, studying at that city's Academy of Fine Art. Remaining in Germany after graduation, he worked for different German companies as a graphic designer from 1952 to 1955. He then moved to Montreal for two years, and then again permanently in 1959. First establishing himself as a freelance designer, with the studio Rolf Harder Design, he eventually joined forces with Roch in 1965. As is explained by Allan Harrison in his introduction to the catalogue of the exhibition The Graphic Design of Rolf Harder and Ernst Roch, the two designers were similar in both their design and their approach to the profession. Both had worked in advertising agencies, but they had both quickly left these jobs which had limited their contact with customers and which had restricted their ability to work at exploring the problems and requirements of functional design. In addition, they both found working directly with clients more rewarding and challenging, since they had to both devise ways of meeting the client's design needs and convince the client of the soundness of their proposed solutions. Choko also claims that Roch and Harder introduced designs which were not only very modern in their shapes and layout, but which also challenged the dominant graphic design colours of red and black. As Choko argues, the designs produced by Design Collaborative were always clear and based on simple geometric forms, only offering essential elements in an exciting manner. In discussing the work of Roch and Herder in Graphis, the Swiss designer Hans Neuburg has claimed that their work is "a combination of constructivism with a penchant for playful experimentation." (page 170) Furthermore, Choko claims that their approach to graphic design is somewhere between the above mentioned positions of Cassandra and Harrison. Where as Harrison despaired of the constraints placed upon artists who do commercial art work, going so far as to claim that one should not become a commercial artist, Cassandra believed that the advertising artist was simply they conveyor of a message for the client. Cassandre claimed that a piece of advertising art did not create a message, it merely forwarded the message of the client to the customer. Harder and Roch, however, believed that if the job of the graphic designer was to communicate a particular message, his or her job is not just to "forward" that message, but to find the optimal means of communicating it. Thus, for them, the graphic designer's job was to reduce the message down to the most essential elements, laid out in the most effective way possible, and to convince the client that the design is the best solution to their design problem. Choko also mention's Colin Naylor's citation of Ernst Roch in Contemporary Design, where Roch claims that the designer's task is not to decorate, embellish, or express his or her feelings. Rather, he claimed that the designer is to examine the design problem realistically and develop and implement the best solutions possible. In the case of Harder, Naylor references him as claiming that the designer is not an artist who is striving to create a work of avant-garde expression. Rather, the job of the graphic designer, according to Harder, is to solve a communications problem, and to be pragmatic, avoiding the urge to complicate the design with personal ideas which could confuse the message. Furthermore, according to Choko, Roch and Harder claimed that they were working to use their works to improve their environment, and the ability of man to communicate in that environment. The work of Harder and Roch was celebrated both within Canada and abroad throughout the 1960s, with the Montreal Museum of Fine Arts holding an exhibition of their work in 1970 entitled "Rolf Harder and Ernst Roch, Design Collaborative. During the 1970s their work was celebrated at numerous international design exhibitions. Finally, in 1977, with the support of Design Canada, the Department of Trade and Industry, and the Canadian Council on Industrial Design, Ottawa launched an exhibition of their work which was to travel to eleven different Canadian cities over a two-year period. Harder and Roch entrusted Allan Harrison to write the text for the catalogue. As discussed above, the federal government had furthered Quebec and Canadian graphic design, including during the war through the NFB, then with the publication of Canadian Art and the establishment of Design Centres in Ottawa, Toronto, and Montreal. However, in the case of the NFB, by the 1950s and later decades its influence upon graphic design had declined significantly. A few works which contradict this trend include the posters for the films Élément 3 and Jusqu'au coeur. The later poster was designed by George Beaupré who was briefly artistic director for the NFB during the mid-1960s. Significantly, it was Beaupré who designed the board's celebrated "seeing eye" logo. He had studied commercial art at the École des beaux-arts in Quebec City before following additional studies in Zurich, and then eventually returning to Canada to work with Paul Arthur & Associates in Ottawa. Starting his work for the NFB in 1966, he left the board and the position of artistic director in 1970. He was replaced by the Verdun born Pierre Fontaine. Fontaine had joined the board in 1967, after having been trained at the Institut des arts graphiques. Following his work at the NFB, Beaupré opened his own studio in Montreal, eventually joining forces with a colleague from Quebec, Jean Arcand, in 1972. In 1974 he was the founding president of the Société des graphistes du Québec. The other crown corporation which had a reputation for advancing graphic design was CBC/Radio-Canada, however, as with the NFB, even its contributions to the field during the post-war years were minimal. The corporation did commission some notable annual report covers, as well as a poster for the fifth anniversary of CBC/Radio-Canada television in 1957, which was designed by Pierre Fiore and was selected for the Art Directors Club of Toronto's 1958 exhibition. While the new CBC/Radio-Canada logo created by the Toronto designers Burton Kramer and Allan Fleming does appear on the cover of the 1974-5 CBC/Radio-Canada annual report, it does not represent the contribution of a Quebec designer. Choko claims that, while one would think that the brochure commemorating the opening of Maison Radio-Canada in 1977 (this appears to be inaccurate, since the building was actually built in 1973) would have been an influential design, CBC/Radio-Canada archives failed to keep a copy, even though some 500,000 copies were printed. Thus, while crown corporations did have an influence upon Quebec graphic design, it was Expo 67 and the 1976 Olympic Games which gave international recognition and employment to many Quebec graphic designers. Locally design contracts concerning both of these events were handled by the Jean Drapeau administration, and the firm which largely benefited from such contracts were the printers Thérien frères, established in 1960. The artistic director and vice president of the firm was Georges Huel. Born in Saskatchewan, but living in Montreal since his childhood, Huel graduated from the École des arts graphique and had been in charge of graphics for Jean Drapeau's 1957 mayoral campaign. He also designed the logo selected in 1972 for the 1976 Olympic Games and was made general manager of design and graphics for the games. His partner at the firm was Pierre-Yves Pelletier, who was born in Montreal and had studied at the École des arts graphique. After working for Thérien frères from 1960 to 1962 he was appointed head of publications design and promotions at Socété Radio-Canada. From 1973 to 1976 he acted as the adjoint director general of graphic design and the director of publications for the 1976 Olympic Games committee. Similarly, Raymond Bellmare, having a graphic arts degree in advertising from the Montreal École des beaux-arts, worked with Huel at Thérien frères, and then with Pelletier at Radio-Canada from 1971 to 1972 before being made director of graphic design for the Olympic Games committee. Other Montrealers involved in design for the 1976 games included Guy Lalumiere, a graduate of Montreal's École des beaux-arts, who created a series of posters for Expo 67, was hired as a freelance designer for the Olympics, probably through connections with Pelletier. Yvon Laroche, who trained at the Intitute des arts graphique, and who worked as a designer for Radio-Canada from 1966 to 1995, was also hired for freelance work, along with Pierre Fontaine (mentioned above), whom Pelletier hired in 1974. Finally, two other Montrealers who had also worked for Thérien frères, Roger Cabana and Réal Séguin, two of the partners of Cabana, Séguin Design (along with Roger Cabana's brother, Marcel Cabana) founded in 1959, were responsible for designing and producing all of the programs for the pre-Olympic competitions held in Montreal in 1975. Roger Cabana had graduated from the École des arts graphique, followed by a year of study at the Pratt Institute of Design in New York, eventually became a lecturer at the École des arts graphique for ten after returning to Montreal, all the while also practicing as a freelance designer. It was at École des arts graphique that he met Réal Séguin, who was his student. Roger later became the creative director of the graphic art studio of Thérien frères, which was established in 1952, making Séguin his adjoint. Interestingly, all of the designers responsible for the design of Expo 67 and the Olympics were locally trained. Choko suggests that this was because of the growth and increasing coherence of the Quebec graphic design community, which formally established itself in 1972 with the first committee created to discus the creation of the Société des graphistes du Québec, which was created in 1974, after the initial formative meetings attracted the attention of several hundred graphic designers from both Montreal and Quebec City. Furthermore, the late 1960s saw a growth in the number of graphic design training programs in Quebec. In addition to the pre-existing École des beaux-arts, in 1969 programs were established at the CÉGEP du Vieux-Montreal and the Université de Québec à Montréal. In addition, in 1970 the CÉGEP Ahuntsic created the Institut des arts graphiques. Choko ends the section by noting that while the Quebec designers of the 1960s and 1970s were thoroughly educated in the International Style, being influenced by the immigrant designers, trade magazines, and international travel and training, their colourful creations did not correspond to what was internationally thought of as Canadian design. For example, in issue 143 of Graphis Hans Neuburg characterized Canadian design as being austere and almost puritanical in form. Between the 1950s and 1970s there were many graphic designers working in Quebec, however, there were some who largely avoided the teachings and trends of the popular International Style. The most well known and independent of these was Gilles Robert, who was from Montreal and attended the École des arts graphique. Following graduation he also learned his trade on the job as an assistant to the artistic director at Benallack Press, Maurice Picard, from 1951 to 1956. Although his work showed the influences of his predecessors, including Arnauld Maggs, Fainmel, and Saul Bass, Choko argues that they also remained personal and easily fused gaiety and pleasure. Vittorio Fiorucci, like Ernst Roch, was born in Yugoslavia in 1932, immigrating to Canada in 1951. He began his career as a cartoonist and then a photographer before beginning a career designing posters. Always working as a freelance designer, his work eventually gained notice. His clients included the Montreal Museum of Modern Art. A good designer, following the American modernist trends of the late 1950s and early 1960s, such as the work of Saul Bass, one of his main weaknesses was his selection, placement, and manipulation of type. In discussing the work of the Montreal, Swiss born and educated designer Gérald Zahnd, Choko begins by mentioning a 1967 article in Print entitled "Graphics in Canada" by the Toronto designer Leslie Smart in which Smart discusses the pro- and anti-Swiss positions in Canadian graphic design. Choko then explains that Zahnd was born in Vevey, Switzerland and studied at the École des beaux-arts in Lausanne, followed by the École suisse de céramique Chavane Revens. He then began a career in poster design, a job which he continued for several small theatres after he moved to Montreal in 1964. He began to do more corporate work as of 1960, for which, as is demonstrated by some examples selected by Choko, his style of design began to reflect the dominant Swiss approach. Eventually, be the 1980s, he abandoned poster and other forms of design, focusing exclusively on his painting career. Another Swiss émigré was Frédéric Metz. Born in Neuchâtel, Switzerland in 1944, he was trained at the École des arts appliqués in Bienne. Moving to Montreal in 1966, he first worked for several advertising agencies before devoting most of his energies to teaching. Very much of the Swiss school, his work was not constrained by that style, but would incorporate simplistic geometric elements with less regulated components. While the International Style, or the Swiss School, had an impact upon the development of Quebec graphic design, it was nothing, in Choko's opinion, to the influence of the postmodern school during the 1980s and the beginning of the 1990s. The influence of the Alchimia and Memphis movements, superimposing touches of vivid colour and baroque compositions, was felt throughout Quebec graphic design. These movements also allowed for the development of a renewed language of graphic design. At the centre of the postmodern design revolution was the graphic design centre at the Université du Québec à Montréal, as well as several other diploma granting colleges. In addition, as Choko explains, part of the particular influence in Quebec came through the arrival of several European designers at UQÀM's École de design. As mentioned above, Frédéric Metz was born in Switzerland, but immigrated to Canada in 1967. He then briefly worked for Publicité RMF and then Omniplast before designing for Guy Lalumière et associés from 1969 to 1972. From 1972 to 1977 he worked as a graphic designer and as the artistic director for GSM Design, and then in 1977 he was made a professor in the École de design at UQÀM. In 1980 he was made the head of the graphic design program at the university. Holding that position until 1985, he was again made head of the program from 1997 to 2000, and then again in 2003. At UQÀM Metz created the Laboratoire de graphisme Bretelle with Alfred Halasa and Georges Singer in 1980. This lab was one of the postmodern creative centres at the university. Metz coworker, Halasa, was made a professor at UQÀM in the same year as Metz. Polish by birth, he trained at the Academy of Fine Arts in Krakow and then in Paris. One of the most prolific teachers in the graphic design school, he designed a large number of posters, many of which were successful, and few of which were ever of the same style. Another Swiss-born designer at UQÀM's École de design is Gérard Bochud, who was appointed to the school in 1988. Born in Bulle, he attended the École cantonale des beaux-arts et des arts appliqués in Lausanne and then immigrated to Quebec in 1968, working for several agencies, including Cossette Communication-Marketing. In 1972 he became director of graphic design at Hydro Quebec, and he also worked on publications for the 1967 Olympic Games. Like Metz, Bochud has also acted at the director of the graphic design program at UQÀM. Appointed as a professor at UQÀM the same year as Bochud, Angela Graueholz was not trained in graphic design but in literature and philosophy. Born in Hamburg, she studied at the Kunstschule in Amsterdam before moving to Montreal. In the mid-1980s she worked with Anne Delson and contributed significantly to the graphic design of several journals including Parachute and Section A, the latter of which was created in 1983 to promote debate about contemporary architecture in Quebec. Three years after both Bochud and Graueholz were hired at UQÀM the department recruited one more graphic designer with postmodern tendencies. Nelu Wolfensohn, born in Bucharest, Romania in 1943, had studied at the Academy of Fine Arts in Jerusalem, obtaining a degree in graphic design and another in art history. He then continued his studies at the University of California and the Massachusetts Institute of Technology before coming to Montreal in 1976 and then being made the artistic director at the engineering firm, Lavalin, the following year. Creating graphics for the company and its subsidiaries, Wolfensohn worked with other Montreal designers, including Lucille Poirier, Pierre Ferland, Pierre David, Lise Charbonneau-Gravel and Luc Parent. As Choko explains in this final section of the graphic design segment of the book, the mid-late 1980s saw the introduction of computer technology which revolutionized the graphic design industry, making the realization of ideas easier to do as it also increased the resources available to individual designers. In 1985 Adobe Systems created the Postscript language, which allowed computers to print creations on a laser printer or an imagesetter. This allowed type and images to be easily reproduced and it was soon being used to reproduced computer edited photography and layouts. As Choko claims, by the early 1990s as many as 75% of designers had acquired computers which were allowing them to produce and manipulate images, and to enhance their layout typography with a choice of hundreds of different fonts. However, with these new tools came the problems/challenges of having the right equipment and the training required to use it. There was also the challenge that many people who were not trained as graphic designers suddenly had the tools to try and design for themselves, a threat which Choko largely dismisses, suggesting that individuals who are not trained in design, and who lack any design talent, simply create bad designs. In addition to the new design possibilities opened up by the introduction of new computer technologies since the late 1980s, the past twenty years has seen a growth in the cultural diversity of Quebec, and those various cultural influences have all affected the creations of Quebec designers. Furthermore, the introduction of the internet in the 1990s has allowed Quebec designers instant access to cultural sources from around the world. Choko claims that the form of graphic design which has emerged since the 1990s is not dominated by any one style, but it also does not reject any styles. All media, all trends, and all cultures are seen as legitimate influences, and all historical styles, including the once-despised and overused Swiss School of the 1960s, are used, augmented, or combined in different ways. Choko ends by noting that increasingly designers are working for advertising agencies and communications companies. Their positions at these companies, as well as the increased use of computers, is leading to their having less real interaction with their clients. Especially in the case of those working for advertising or communications firms, while having tools which make them more productive, they are sometimes denied the ability to take, or sell clients on taking, risks or marketing their good designs. However, he also notes that there are still some less restrictive organizations which encourage creative design. These not only include smaller design firms, staffed with and run by designers, but also places like the Centre Design at UQÀM, which has been led by Choko since 1999 and which hosts exhibitions of talented Quebec designers. After reading this long article. I admit that CAnada is not that Canada before 10 years. Good luck..